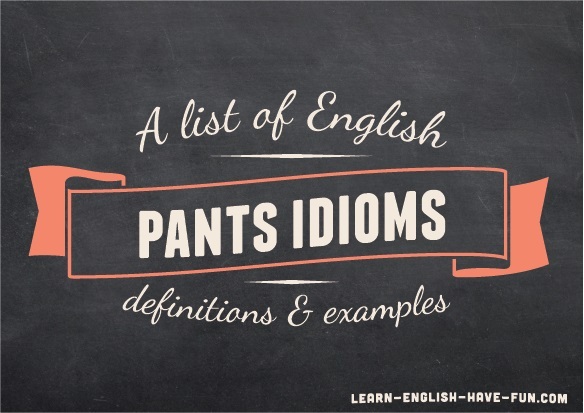 Hopefully these pants idioms won't "scare the pants off you!" No, of course they won't. It's not scary at all and by creating an image of the idiom in your mind it will be easy to remember these in the future. 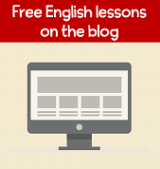 By the way, if you need a review of what an idiom is, just click here. You can also find many other idiom categories and examples here. To practice, leave a comment at the bottom of the page. Remember, practice is vital for helping you remember new expressions. ants in (someone’s) pants: to be very excited, nervous or fidgety (move around a lot). The little boy jumped around like he had ants in his pants during the long church service. beat the pants off: to easily win against someone by a large margin or score. The home team beat the pants off the visiting team with a score of 50-3! bore the pants off: to be extremely boring or uninteresting to someone else. The businessman bored the pants off everyone he met with his long stories about the stock market. catch (someone) with their pants down: to surprise in an embarrassing situation or to find someone doing something wrong. Santa was caught with his pants down when the kids saw him taking toys instead of putting them under the Christmas tree. charm the pants off: to be very charming or appealing to someone. Joseph tried to charm the pants off the new legal secretary but she was not impressed with his compliments and flattery. kick in the pants: someone’s that gets someone’s attention or strongly motivates them to do something. Sandy’s huge credit card bill was the kick in the pants she needed to stop spending money and get a job. scare the pants off (someone): to frighten someone a lot. Michael was taking a photo of a flower when a giant bear jumped from behind a tree and scared the pants off him. Spiders used to scare the pants off me but after I spent a month camping this summer. Now I'm not scared of any insects. smarty pants: a person who is annoying because they always have the right answer or know everything. None of the other kids like Sally because she was such a smarty pants always shouting out the answers to the teacher’s questions without raising her hand. wear the pants (wear the trousers British English): to be person in charge of a relationship or marriage. Traditionally, men almost always wore the pants in their marriages but today women who have jobs have much more influence in their families. Okay, time for me to try to give you a kick in the pants.... Writing a sample sentence below shouldn't scare the pants off you! I really encourage you to practice and not just read. This is a friendly place to practice and I'll correct your sentence if you need some help.